There are close parallels in nutritional requirements for brood stock in the production of high quality spawns and in the requirements of early larval stage animals. Deficiencies in the Essential Fatty Acids (EFA’s) often express themselves as higher rates of deformities, abnormal development, mal- pigmentation, sub-optimal or arrested growth, and overall lower survival in larval stocks. These are particularly noted in marine species wherein the following stages after yoke depletion requires intermediate live feeders such as rotifers, copepods and Artemia sized selected to mouth gape issues of the larval stage. Survival through the larval stages is perhaps the most critical period determining fish recruitment, cost of operations to produce “seed”, and overall success of any aquaculture species development for commercial implementation. Fatty acids are classified within the lipid macronutrients with a main role of energy production for metabolism in the form of ATP (Adenosine Triphosphate) synthesis. When compared to carbohydrates and proteins, fatty acids produce the most ATP on an energy per gram basis. Other roles played within the biological system, includes phospholipid membrane formation, signaling pathway development and energy storage. Fats help in the absorption of fat-soluble vitamins A, D, E, and K.
RED AlgaMac (Rotifer Enrichment Diet) was designed as a rotifer and Artemia enrichment formula which maximizes the oil soluble vitamin package containing vitamins A, B series, C, D, and E. Roughly 97.5% of these vitamins are naturally occurring in non-GMO cells of algae, yeasts, and fungi, which are produced under food grade protocols in bio-fermentation and in some cases, under autotrophic conditions. RED AlgaMac is produced from different species of single-celled organisms and incorporates both whole and fractured cell forms for maximum bio-availability of the vitamins, protein opsin, retinol and glycerophospholipids, all important in overall growth, ocular and morphological development in the early life forms. 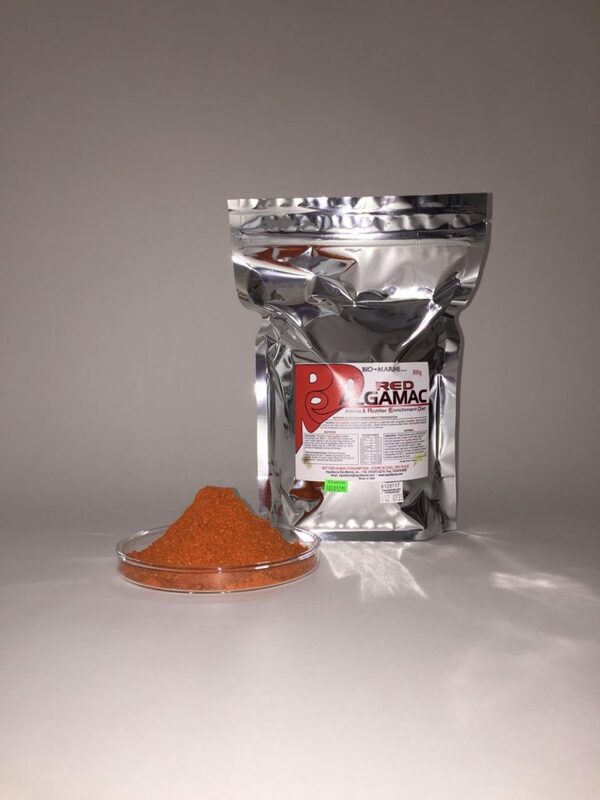 RED is a balanced total product fat with high levels of DHA, Vitamin A, B complex, Ascorbyl palmitate a fat-soluble form of vitamin C (also approved as a food antioxidant in the EU, the U.S., Australia, and New Zealand), and Taurine, an organic acid widely distributed in animal tissues. Taurine has many fundamental biological roles such as conjugation of bile acids, antioxidation, osmoregulation, membrane stabilization and modulation of calcium signaling. It is essential for cardiovascular function, development and function of air bladder, skeletal muscle, the retina and the central nervous system. Sustainably produced in heterotrophic and autotrophic systems. A dry nutrient enrichment product that is prepared (blended with water) on-site (100% nutrient value no water cost in product or transport). Highly reduced costs for enrichment (per million rotifers or Artemia) per application (algaeproduction greatly reduced or eliminated and product is consistent out of the bag). Packaging waste minimized with use of vacuum foil bags since RED is dry (no empty containers to dispose of). Application: 90 grams RED AlgaMac powder (emulsified) per billion (1,000,000,000) rotifers per cubic meter applied in two 45 gram applications; one at the start and a second application after 4 hours. Rotifer density may be 1,000,000 rotifers (or more) per liter of seawater during enrichment. Total enrichment time: 6-8 hours at water temperature 25-30°C. Aerate vigorously so that oxygen levels >4.0 ppm (mg/l) during the 8 hours of enrichment. Harvest and rinse enriched rotifers. Application: Artemia density may be 500,000 nauplii (or more) per liter of water or 500 million naup/m3. Add the prepared RED mixture to the enrichment tank in two applications each at a rate of 175 grams/m3 (500,000,000 naup/m3). Aerate enrichment tank vigorously so that oxygen levels >4 ppm (mg/l) during the 24 hours of enrichment at water temperature 25-30°C. Harvest and rinse enriched Artemia nauplii after 24 hours. Research on marine fish egg fatty acid profiles reported since the late 1980’s indicate that primary fatty acids found in the lipids of marine fish eggs are DHA, EPA, as being essential relative to early larval development once the yolk sack has been consumed. Palmitic and Oleic acid are often also cited but research is sketchy on their status on being essential for early larval development. For the reasons cited above by Davis and Dinis, the window of application for balanced nutrition is quite limited and critical, being highly related to the presence of these fatty acids coupled with appropriate sizing for stage development feeding. Most marine fish hatcheries currently use rotifers and/or Artemia as the first intermediate food source post yolk absorption, depending on species. RED is formulated with three of the four fatty acids normally void or deficient in most rotifer or Artemia commercially available. Oleic acid (n-9) was not added nor is significantly present from any of the other components used in the formulation. Cells of heterotrophic and phototrophically produced algae, yeast and vitamins. Whole cell count > 98%. 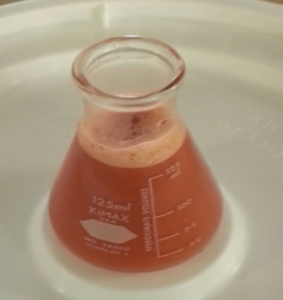 Product should be stored cold (< 4 degrees C.) to maintain viability of astaxanthin. Shelf life of 24 months.